Modern life styles affect how we live, play and interact with each other. Over the past 20 years, populations have become physically inactive. This poses a challenge to leisure areas, which should encourage physical activity more than ever. 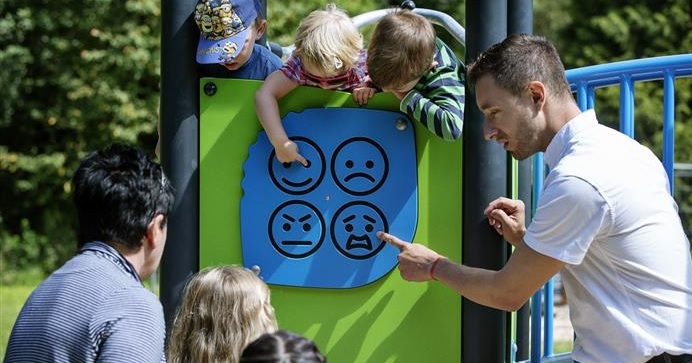 KOMPAN sees it as its fundamental purpose to motivate playful physical activity. “That every child has the right to rest and leisure, to engage in play and recreational activities appropriate to the age of the child and to participate freely in cultural life and the arts. We believe that all people regardless of age and abilities should experience the joy of being physically active, and they should be offered opportunities for and access to play and exercise in their neighbourhood. Active people are happier people. Physical activity contributes to well-being, physical and mental health and helps people perform. Physical activity gives people a zest for life and a bigger inclination to contribute positively to happier, healthier communities. In the industrialized countries, the majority of the population lives in urban areas. This means less room for recreational, physical and social activities as more and more space is taken up by infrastructure and business. The increasingly sedentary nature of everyday life is creating communities where people are physically inactive. Globally over 25% of all adults and over 80% of adolescents are physically inactive. This affects health negatively and entails alarming future health disparities and expenses for our societies. According to the World Health Organization WHO, physical inactivity is among the four biggest risk factors for premature death. The benefits of being physically active for the individual are well known and documented. Active people improve both their physical and mental wellbeing, and this in turn boosts their individual development. However, the benefits are much bigger than most of us suspect: An active city is a developing city that invests in improvements for not only for economy, infrastructure and environment, but also for active leisure opportunities for all citizens, to improve health and social life. Research initiated by KOMPAN shows that people want to be physically active but they fail due to work and transportation taking up their time, due to limited access to free leisure facilities, and due to neighbourhoods being unsupportive of physical activity. This is a valuable insight; as research, shows that a significant 60% of people feel that today’s public spaces do not motivate them to be physically active. KOMPAN sees it as a main mission to help create and document attractive, public leisure areas for health, well-being and social interaction.